LEXINGTON, Ky. (Oct. 19, 2018) — Fetal alcohol spectrum disorders are an array of conditions that can occur in a person whose mother consumed alcohol during pregnancy. Fetal alcohol syndrome (FAS), the most severe of these conditions, often results in physical abnormalities, behavioral development issues and intellectual disabilities. Researchers at the University of Kentucky College of Medicine have discovered that targeting a specific signaling pathway could potentially provide a new therapeutic avenue for treating FAS. 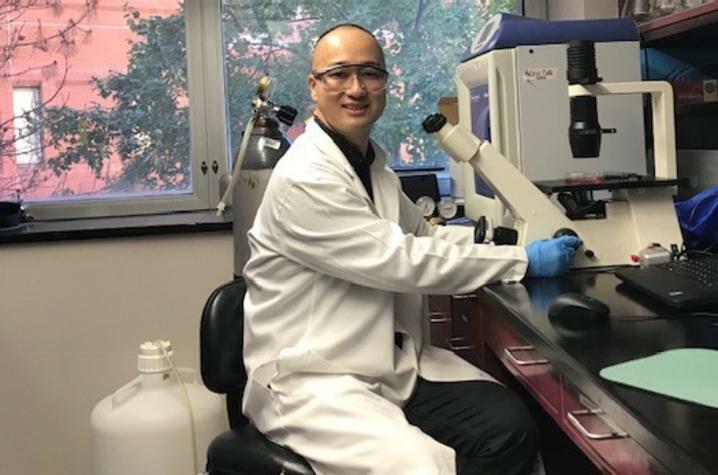 Kai Zhang, a doctoral student in the Department of Pharmacology and Nutritional Sciences, has worked as a member of Professor Jia Luo’s lab to study signaling pathways in the brain. Their research has revealed that targeting the MCP-1 signaling pathway could inhibit alcohol-induced neuronal death in the developing brain. MCP-1 is a small protein that is produced by the immune cells in the brain after alcohol consumption. The protein binds to its receptor, CCR2, and creates prolonged inflammation which kills neurons, causing brain shrinking and long-term behavioral deficits. The National Center on Birth Defects and Developmental Disabilities estimates that up to 1 in 20 U.S. children are affected by FAS. While there is currently no cure for FAS, this study sheds light on the development of anti-MCP-1/CCR2 therapy and furthers awareness of abstaining from alcohol during pregnancy. This research was recently published in the Journal of Neuroinflammation. To view the complete study, visit www.ncbi.nlm.nih.gov/pmc/articles/PMC6034273/.